Nothing quite steals the anticipation of seeing your footage like a pop up error message. How did the file get corrupted? And more importantly, can you repair a corrupt GoPro video? Often, a corrupted GoPro file is the result of the camera shutting down unexpectedly — perhaps you crashed a drone or maybe just ran out of battery. As you record, the GoPro needs to index the video so that it can be read and replayed. If your GoPro stops recording unexpectedly, that index is never created and you're stuck with a corrupt file. Thankfully, a missing index file is easy to fix. While you'll still want to avoid unexpected shut downs whenever possible, here's how to repair GoPro MP4 files. Method 1: Look for the SOS signal. GoPro has a built-in failsafe to help correct these corrupt files. If you are having trouble opening the file on your computer, put the micro SD card back into the GoPro and power it up. If the GoPro detects an indexing issue, the small screen in the front will show a bicycle, or bandaid icon for newer GoPros. If you don't see the repair icon, try removing both the battery and the micro SD card. Replace only the battery and turn the GoPro on, then try inserting the memory card while the camera is on. The GoPro SOS method is a simple way to repair GoPro files, but it's very limited. Once you run through the SOS, you can't run it again. And since there's no way to bring it up on the screen, you can only use it if the GoPro itself detects the corrupted file. The SOS method is also limited to correcting a missing index, when there are a few other issues that could potentially create problems. When the GoPro SOS fails, what then? The right software program will allow you to repair files that even the GoPro SOS couldn't fix, or for scenarios when the option didn't even appear. 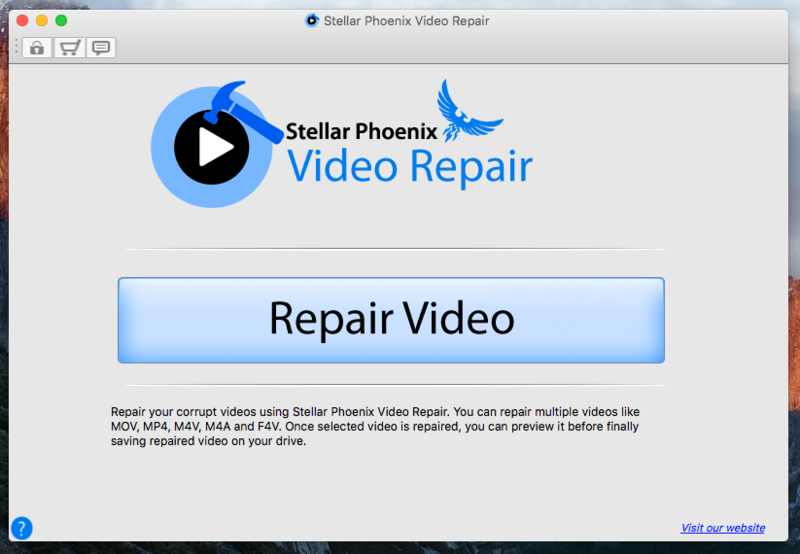 There are a number of different file repair software programs that are good; Stellar Phoenix Video﻿ Repair is a favorite because, frankly, it's simple to use. You can also get a trial version to see if the program will work for your corrupted file before you spend anything. With Stellar, you simply open the application, hit the light blue "Repair Video" in the center to continue, then select your corrupted GoPro file and click repair. The software will automatically analyze the file and start the repair process. If the file can be fixed, you'll see a preview of the results. From there, you can download the new, repaired file. While many corrupt MP4 files can be repaired, prevention can save you some time and a few headaches. If you frequently encounter corrupt GoPro files, you'll want to try some of these tips. Use a GoPro approved memory card. Not every memory card will work well with the GoPro, if the read and write speeds aren't fast enough, you could wind up with file errors. Format your memory card often (once you've saved all the videos you want from it of course). File issues can be caused from improper format. Avoid running the GoPro with a low battery sign—running out of juice during a recording could cause the video to have issues. Bring a backup battery along to use when the first one is getting low. Always properly eject your GoPro or the SD card form your computer. If you pull the card or USB cord out while files are being transferred, you run the risk of corrupting the file. Instead, drag the desktop icon to the trashcan, or click the eject icon next to the card name inside a file browser window. Keep your GoPro protected by using the right case and mount for what you are shooting — for example, GoPro recommends using the I/O door that covers the memory card slot, for example, to minimize vibration. Take the time to clean your GoPro and memory cards at least once a year — and be sure to let the camera fully dry after being submerged before removing the SD card. Use a cotton swab or old toothbrush with some rubbing alcohol to clean the metal contacts on the card, and gently dust out the inside of the SD card slot with a can of compressed air. Because most GoPros are used in extreme conditions, file errors can be pretty common. GoPro has a built-in SOS failsafe that will repair some files, and there's a software program available for bigger fixes. Make sure to also take steps to prevent more corrupt files in the future, like using an approved SD card.